Sometimes I write stories that have nothing to do with Regency England, sometimes I write Regency stories that have nothing to do with my "series," and sometimes I write stories that have nothing to do with romance. If they're not free, you'll find these stories listed here. 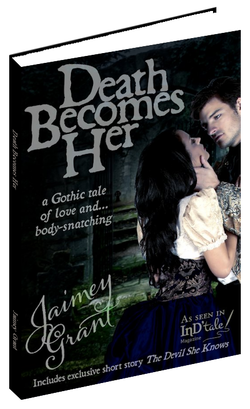 Death Becomes Her is the second serial Regency written exclusively for InD'tale Magazine. It is a Gothic tale of love and...body-snatching. Part One appeared in the June 2013 issue. Subscribe to InD'tale Magazine to read it FREE in archived editions of the magazine, or if you're just not sure it's for you, click the cover to read an excerpt. It's also been compiled and published for those of you who'd like it all at once. The compiled edition includes an exclusive short story not seen by readers of InD'tale Magazine. Click HERE for purchasing options. Click the cover for excerpts. The Dragon's Birth is my first $0.99 offering to the e-book community. As a prequel to a longer work, it stands alone, though some may feel it ends on a bit of a cliffhanger. ◄Click the picture for an excerpt. In this multi-genre anthology, the writers had to use three Clever Fiction short story prompts: New, Whisper, Spring. What resulted was an eclectic collection in a range of genres, subjects, and themes, the three things Clever Fiction writers do best. My story, a Regency short called Eliza's Epiphany, is featured in this collection. Go to Purchasing Options to find out how to get this book. Click the cover to read a short excerpt of my story. Gertrude's Grace is a short tale about a girl who cannot claim grace as an attribute. She does the best she can to cope in a Society that demands perfection... at least on the outside. This book was released April 4, 2016. Links to excerpts can be found on the book's page. Just click the picture.